Create you own crazy voice effects. Speak into the microphone and hear your voice at the same time through the speakers. But it will not be your voice. It will be the voice of a monster, killer, alien or any crazy voice you can think of. 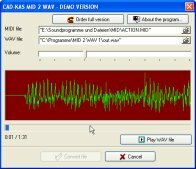 You can save your recorded voice as mp3 or wav file. 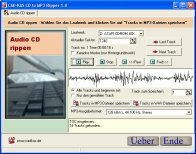 You can read in existing mp3 files or music CDs. The program ships with a couple of predefined effects. But you will be able to create new effects. With this plugin for Teamspeak you use different effects to distort your voice in a funny way. You can let your voice sound like an Alien, Monster, Murderer, Space Voice or simply higher or lower. With an installer for Teamspeak. You only click on the file and Teamspeak will install the plugin. In the menu Plugins in Teamspeak under Crazy Voices you click on the effect you want to use. From now all you say will be distorted by the selected effect. You can record the session so that you can hear who other users hear you. Save the music from your music cd's as mp3 or wav file on your harddisk! Only one click and all tracks of the CD will be saved as mp3 files. So you can hear your favorit music every time you work on your pc and don't stress your valuable music cd's. You can use this mp3 files in various ways. You can put these files on a mp3 player or create a new mp3 music cd with hours of music. Or you can create your personal music cd with all your favorite songs. Create your own ringtones for your realtone mobile! Read in a track from an audio CD or open an existing mp3 or wav file from your hard disk. You can cut out unimportant parts, change the volume and speed and use effects like echo. Cross fade the end to the beginning for smooth playback in a loop. Now you can save the ringtone as extreme small mp3 file (about 60 kbytes per minute). You can then send the mp3 file to your realtone mobile. 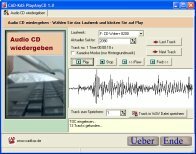 PlayAnyCD helps you to play and fix scratched music CD's on your PC. If your CD drives can detect the CD your chances are good to play it on your PC You can save the tracks as WAV files. The program has a Karaoke mode in which you hear only the background music.